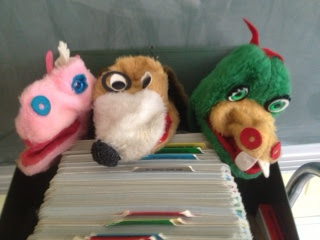 As part of my celebration of Better Hearing and Speech Month, a blog reader, Connie Ziko, is sharing some of her old speech therapy materials. It’s clear I’m still a newby in this field. I have colorful fun decks and clipart galore. Many of you started speech therapy a few decades ago with a whole different set of treatment materials. Connie is taking us back in time to look at some old material sets that are still hanging around at her place of employment! 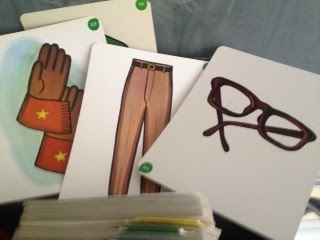 When I accepted my first SLP job I used this language kit. It was a standard “in my day“. There were 3 kits . This green kit was intended for 4 1/2 to 6 1/2 years of age. This kit was copyrighted in 1965 and published by the American Guidance Service (AGS). An updated kit is now published by Pearson. In the kit : 180 daily lessons in a spiral bound manual. 430 colored cards in 13 different categories . ( Not real photos) 10 extra large poster scenes. 350 plastic colored clips . 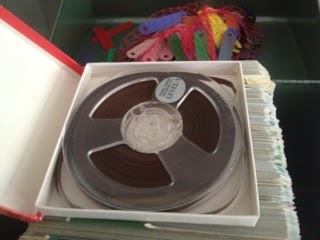 2 puppets 1 reel to reel tape with 6 narrated fairy tales . (Check out that TV on the card :)) The lessons were not intended to “replace the regular activities” in the daily classroom. 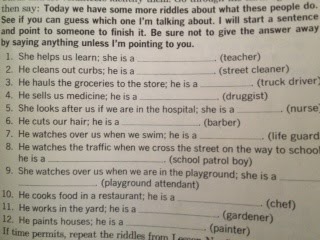 The lessons have been planned to “provide repetition “in the oral language program. 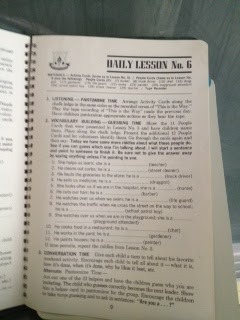 If you take a look at the activities on the lesson that is pictured some of the same tenets still hold true. That was AWESOME! Ok, am I the only one thankful for voice recorders, ipads and youtube? Stay tuned for more pictures from Connie! If you have photos of some ‘Back in My Day’ materials, please submit them to speechroomnews@gmail.com. Love this! 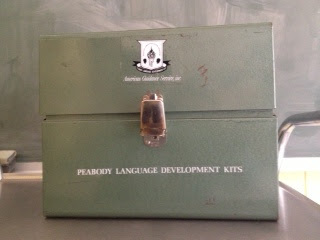 I had three kits (green, blue, and orange) when I started as an SLP in 1978! Anybody out there remember the Fokes Sentence Builder? I used it in 1980 when I student taught. I have pictures from Connie of the Fokes! that is part two! Anyone out there remember the ADD kits (Auditory Discrimination in Depth) and the ITPA? I remember the Fokes; I modified and created my own version in the 2000’s. It provided a great visual cue for correct sentence structure. I remember! Yes, I also remember the Fokes Sentence Builder and all of those artic cards! When I started practicing, the GFTA had a GUN as a stimulus item, right next to a KNIFE, and a beetle or something that ALL of the kids I gave it to called a cockroach. I’ve noticed that lately most of the kids say that the “calculator” in the CELF is a cell phone . I’ll take a picture of some really old cards we have and try to upload it here. Wow! Does that bring back some memories! We’ve come a loooong way, baby! How fitting to see this post! I was just at a yard sale over the weekend and saw this same metal toolbox. I had no idea what to expect inside of it as I’ve never come across the kit in my 10 years as an SLP. I excitedly opened it up, but to my disappointment it was empty. Glad to see what should be in the kit! Thanks so much for sharing. I just found the orange kit in my room! This is my first year as a speechie, and I started a few weeks after the beginning of the school year, so I just came in and didn’t do a whole lot of organizing until now. Is it worth hanging on to? Or things I should take out of it? Would love to know more about it! At the time, those Peabody kits were a life saver! hahahaha I know a teacher who still uses Mr. Peabody! 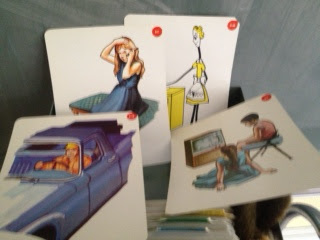 Used High Hat stories this year and my students loved them!